Fibroblast growth factor-18 (FGF18) has been reported to have significant anabolic effects on cartilage. We therefore examined its effects on repair of cartilage damage in a rat meniscal tear model of OA. RESULTS: FGF18-induced dose-dependent increases in cartilage thickness of the tibial plateau, due to new cartilage formation at the articular surface and the joint periphery. 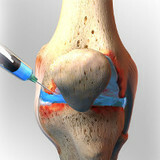 The generation of new cartilage resulted in significant reductions in cartilage degeneration scores. The highest dose of FGF18 also induced an increase in chondrophyte size and increased remodeling of the subchondral bone. CONCLUSIONS: The results of this study demonstrate that FGF18 can stimulate repair of damaged cartilage in a setting of rapidly progressive OA in rats. In addition, FGF18 produced dose-dependent increases in medial tibial cartilage thickness, from 243 21 to 319 77 µm (mean SD, p<0.05) in rats treated with vehicle or 5.0 µg of FGF18, respectively. The morphology of the repair tissue ranged from fibrous with proteoglycan deposition to fibrocartilage. Repair tissue appeared to originate from the marginal zone areas and extended across the degraded and sometimes intact surfaces. In nearly all areas, repair tissue appeared to integrate well with the margins of the remaining normal cartilage. Although the morphology of the repair tissue was different from hyaline cartilage, it appeared to effectively fill the defect and there were virtually no degenerative changes. In contrast to the FGF18-treated animals, rats treated with vehicle alone showed no signs of cartilage repair except in rare cases where erosion of the subchondral bone permitted influx of bone marrow stem cells. Since osteophyte development appears to be a sequential process39, it is possible that the chondrophytes would undergo endochondral ossification with more time. However, little or no vessel invasion or bone formation was observed within the cartilaginous outgrowths over the time course of the present study. Additional long-term studies will clearly be required to resolve this issue. These data demonstrate that local delivery of FGF18 in a hyaluronan carrier can increase cartilage formation and can reduce cartilage degeneration scores in a rat model of osteoarthritis. Here's a patent filed by ZymoGenetics in 2008, the company that funded this study. It seems like hyaluronic acid is the carrier of choice.